Renew Your SIA Membership for 2019 Online Today! 2019 Dues Renewal: Your membership runs from Jan. 1 to Dec. 31. Renewing online helps reduce costs and it’s good for the environment too. If you prefer to renew by check, you can print and mail in a membership form from the SIA website. Household Memberships: Effective for 2019, SIA “Joint” memberships have been renamed “Household” memberships. The household membership level allows SIA members to add a second person, at the same mailing address, to their SIA membership for only $5 above the cost of a regular Individual membership. Only one set of publications will be sent per household, but the second member is considered a full SIA member in all other respects, including voting eligibility and event participation. Your dues cover the publication of newsletters and journals, as well as the general operations of the SIA: By making additional donations or upgrading your membership to the sustaining or contributing level, you help fund additional Society activities, such as Student Travel Scholarships and Industrial Heritage Preservation Grants. Any dollar amount over the basic individual or joint dues rate is considered a donation and is tax deductible for U.S. federal income tax purposes. Opt out of the printed version of the SIA Newsletter: Help reduce the SIA’s environmental footprint by choosing to receive your SIA Newsletter digitally. Additionally, opting out of print directs cost savings to other SIA programs. Select YES to the SIAN digital delivery option when you renew electronically, or check the “Opt Out of Print” box on the mail-in renewal form. You will receive links to the newsletter PDFs via email, and you will continue to receive paper versions of the IA journal as they are published. Professional License: Let us know if you have a professional license (such as LEED AP credentials, Registered Archaeologist, Licensed Architect, Attorney, Engineers and other IA related fields) along with which state or province the license is valid for. Gift Memberships: The holiday season is a great time to give a gift membership to a friend or relative. New gift members will receive a letter announcing your gift along with a the most recent Newsletter and IA Journals, plus a special gift. Online Gift Membership. 2019 Annual Conference: Our 48th Annual Conference will be held in Chicago, Illinois June 6-9, 2019. Student Travel Scholarships: The SIA awards travel scholarships to help full-time students and professionals with less than three years of full-time experience to offset some of the expenses of attending our annual conference. Deadline for applications is March 31, 2019. 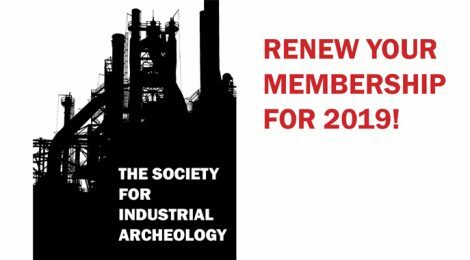 Order back issues of IA: The Journal of the Society for Industrial Archeology, including a special price on a set of 41 back issues.